One of my favorite foods to eat is a burger. Who doesn’t like a hamburger? Well of course burgers aren’t a good choice if you are watching what you eat, but there are ways to take away that burger craving and eat something relatively healthy. I’ve tested a few different homemade burger recipes myself but I just recently came across my favorite recipe yet. You are going to have to substitue the beef for turkey and prepare it yourself, but they taste amazing. The name is the “Asian Turkey Burger” and it was created by Dave Ruel and Karine Losier from “Metabolic Cooking“. They’ve given me a number of samples of some of their new recipes and I’ve been extremely impressed with how they’ve found a way to make healthy choices taste great. If you don’t know Dave or Karine they are a couple that have created one of the most famous internet healthy cookbooks in the world. It is called Metabolic Cooking and it is full of great quick and easy fat burning recipes. Not only is the cookbook full of great healthy recipes, but each recipe has been designed to help increase your metabolism, they provide nutrition profiling with each recipe, and they’ve got dozens of categories ranging from salad dressing to breakfast to smoothies. You can check it out by clicking here. Anyways as I received an exclusive sneak peak at their new Metabolic Cookbook 2.0 they allowed me to share one of my favorite recipes with you – the Healthy Turkey Burger. 3. Divide into three equal portions and form into burgers about 3/4 inch (2 cm) thick. I highly recommend you give this a try. Even though it is healthy it is damn good tasting and these homemade turkey burgers have helped me get rid of any burger cravings I have. If you enjoy this meal you will probably want to visit the Metabolic Cooking 2.0 website and get access to their library of over 200 healthy and fat burning recipes. Karine is also giving sneak peak access to her kitchen where she will have a video series full of cooking videos. 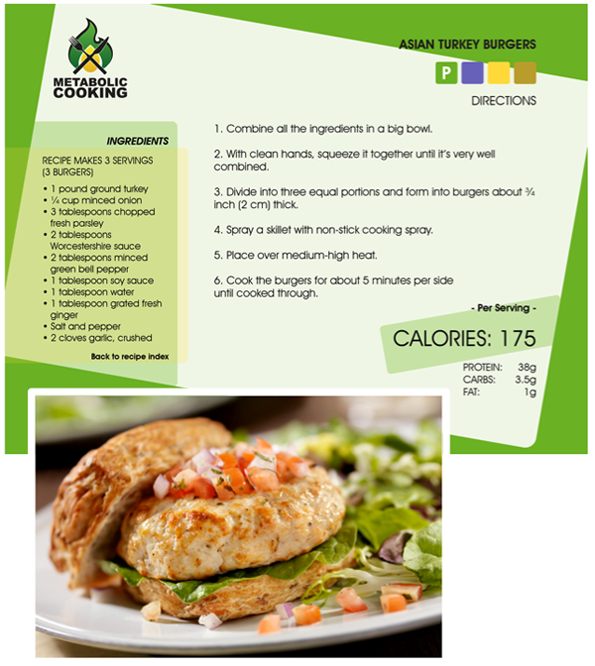 Below is the recipe sheet that they provided for this healthy turkey burger recipe (they have one of these for each item in their healthy cookbook).